What if the media — in its eagerness to neatly summarize the New Zealand terrorist attack within a “good guys” vs. “bad guys” context — is getting things exactly backwards, and is actually helping the terrorist realize his ultimate wish? That’s not just a rhetorical question. That’s actually what’s happening. If you’ve watched the news since reports of Friday’s horrific attack began circulating, you’ve heard the killer was a white supremacist who hated immigrant “invaders” and was clearly inspired by the white-supremacist movement in the United States, specifically President Trump. But this narrative reveals more about the media than it does the killer. In painting the terrorist as a simple-minded anti-immigrant zealot, the media glosses over many conflicting details at their disposal. Finally, to create conflict between the two ideologies within the United States on the ownership of firearms in order to further the social, cultural, political and racial divide within the United states. [sic] This conflict over the 2nd amendment [sic] and the attempted removal of firearms rights will ultimately result in a civil war that will eventually balkanize the US along political, cultural and, most importantly, racial lines. But for every comment about his hatred of immigrants, there are comments about his adoration of the environment. The manifesto appears designed to give both sides things to seize on, so that they can turn on each other. And the media is taking his bait. Rather than reporting the facts exactly as they’re known, the U.S. media is electing to selectively report on details from the manifesto — details that happen to coincide with a larger, anti-Trump, anti-“right wing” narrative. These reports are generously peppered with mentions of “anti-immigrant,” “anti-Muslim”; if you happen to be a member of one of these groups, you might be persuaded that your homeland isn’t as welcoming as you’ve always believed. If you’re a normal human being sympathizing with the victims, and their families, of this tragedy, you might be inclined to respond to all of this coverage by turning your anger against the president, against his supporters, perhaps even against anyone who supports enforcing immigration laws. And if you’re a Trump supporter who’s now being attacked by those aghast at the tragedy in New Zealand, you’ll inevitably defend yourself, perhaps angrily. In short order, discord and disunity are ramped up, exactly as the killer sought. The killer’s manifesto was like a catalog of hot button cultural flashpoints. It’s clearly designed to provide fodder for the extremes on both sides. He celebrates his white identity while also holding up black conservative Candace Owens as one of his heroes. If you’re trying to understand how all of this can simultaneously make sense, you’re already giving this more thought than most of the major reporters covering the story in the national media. He says he’s concerned about climate change, but that this issue is driven by overpopulation, a point made most often among progressives (some of whom have even wondered whether having children is morally defensible). Another clue that the killer wasn’t singularly motivated over racial concerns comes from his stated preference for political systems. If racial identity composed the entirety of his worldview, nations with the most restrictive immigration policies — like Poland and Hungary — would surely be his preferred countries. Instead, he says communist China is the nation that most clearly mirrors his own political preferences. 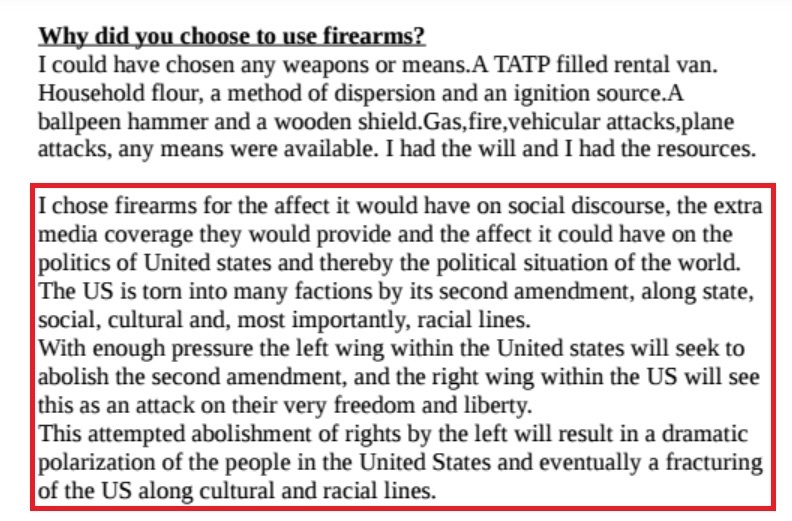 In discussing his mode of killing, the terrorist says he could have used any weapon, but chose guns specifically to ignite controversy in the United States. Once again, these conflicting details are utterly absent from the media’s coverage of this atrocity. Whether wittingly or not, the media is being used. The killer understand he could use their megaphone to use existing divisions to further turn the nation against itself. Ironically, it’s the same strategy Russia deployed in the 2016 presidential election. This time, though, the media is aiding and abetting. The killer is surely delighted.